Part of being an effective Digital Marketer is staying on top of emerging digital platforms and, more importantly, strategies that can be applied to those platforms. Here are three such strategies, intended to get your creative marketing juices flowing. You probably already knew that you could serve Instagram ads via Facebook’s ad platform, right? But, did you know you can create a remarketing list of people that interacted with your Instagram ad and show those people follow-up ads on Facebook? How about Youtube video ads? Did you know that you can create a remarketing list out of people that viewed your Youtube video and continue the conversation on the Google Display Network (GDN)? Well…you can! Use an industry-relevant infographic as clickbait for an Instagram ad. Follow-up with a Facebook page post ad pitching a lead magnet in exchange for the prospect’s email address. For example, let’s say that you’re offering digital marketing services to eCommerce companies. The infographic could be about the projected growth of eCommerce sales in different business categories. You’ve successfully segmented your target audience with the Instagram infographic because, let’s face it — who would click on that infographic if they weren’t interested in eCommerce? 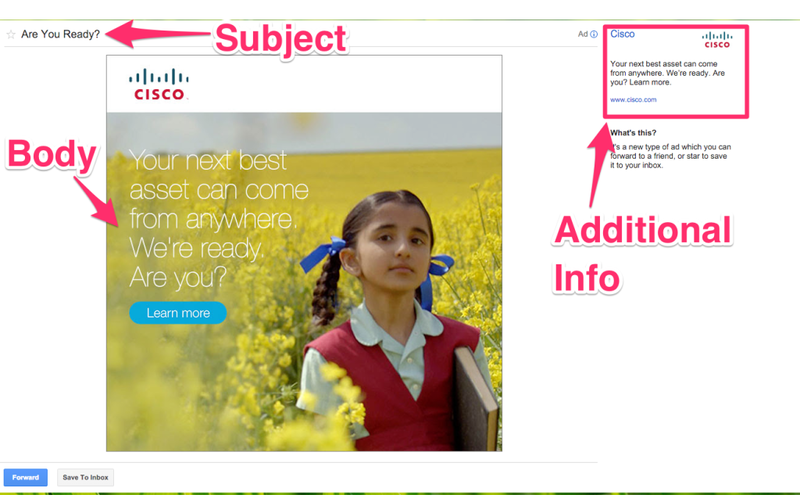 If you didn’t already know that you could serve ads in Gmail inboxes this one is a two-fer! Gmail ads allow you to target Gmail users using regular ol’ GDN (Google Display Network) targeting criteria. The only audiences you can’t target are: remarketing lists (I know, I know — I’m hurt by this one too), In-Market Audiences (seriously, Google?) and placements that aren’t mail.google.com (okay, this one makes a lot more sense than the first two). You CAN target — customer match lists (lists created from customer email addresses) and domains that appear in the user’s inbox. These are particularly powerful because showing ads to customer match lists allow you to target people that you’ve already done business with. And targeting specific domains on the GDN allow you to show ads to users that are receiving emails from your company, your competitors or…anyone, really. With Gmail ads you get charged when someone clicks (or expands) your ad unit (which is kind of like opening an email). If someone clicks a link inside of the expanded ad unit, you don’t get charged! Read that last one again — CUSTOM HTML UPLOAD! That’s right! Google is letting you make your own ad with HTML! But, wait! There’s More! — With Custom HTML ads in Gmail you can do things previously unimagined like: show a video, add a click-to-call number or ADD A LEAD CAPTURE FORM! You read that last one correct. Not only are you already in the inbox of prospective customers but you can also request their email address within an ad unit that LOOKS LIKE AN EMAIL. Treat Gmail ads like you would a regular ol’ email! Read that last sentence three times and commit it to memory. Think about it this way — if you were going to sit down and write an email to someone that didn’t know you and ask them for their email address you’d have a little explaining to do. First, your subject line would have to generate interest with you target market. After all, you want them to click to expand your ad unit, otherwise you’re not going to get anywhere. Second, you’re probably going to need to provide some value upfront. I know that if someone is asking for my email address there better be a REALLY good reason. Maybe provide some kind of tip or hack that can get your prospect started on whatever it is you’re going to be pitching. Third, you need to clearly communicate that if they want more great tips and hacks from you they’re going to have to provide their email address. Let’s say that we’re selling an online course for building WordPress websites. First, I’m going to setup the targeting using domains as “placements.” The domains I’m going to use are: mail.google.com (so it targets Gmail users), then some competitors or other content producers. Maybe — wpbeginner.com, wpmu.dev, etc. The user is already receiving emails from WordPress-related websites AND some of those emails are likely to end up in the “Promotions” tab of Gmail (where our ad is going to be displayed). Awesome! Since we’re selling courses on WordPress we want to find people that are frustrated, otherwise they’re not likely to spend much money. Did we accomplish that in the subject line? Yup! Our offer (the Free WordPress course) is highly relevant to the problem — if someone is struggling with setting up WordPress websites, our free course will help with that. That said — does our offer inspire action (the user entering their email address)? Sure does! In the first example, we did some cross-platform remarketing — we took an audience on one platform (Instagram) and showed them follow-up ads on another platform (Facebook). Now, we’re going to take an audience from one device (mobile) and show them ads on a different device (desktop or tablet). I know what you’re thinking — Why on Earth would we want to do this? Anytime I’ve run a campaign on Facebook that drives traffic to content (ie links to a blog post or shows a Facebook video ad), CPC (cost per click) or CPV (Cost Per View, in the case of video) tends to be anywhere from 3x to 30x more expensive on desktop than it is on mobile. You read that correctly, I’ve had ads…to content…that costed 30 times more on desktop than on mobile! Conversely, I’ve run Facebook ads to offers that costed pretty much the same on both devices but converted like gangbusters on desktop and barely converted at all on mobile. Let’s face it, mobile is great for scrolling and perusing content but it’s still a pain to fill out forms, enter credit card information, etc. That said, we can target mobile users and send them to content. Then retarget the same user on desktop and send them to a targeted offer of some sort. Since driving traffic to content (or showing videos) tends to be more expensive on desktop, we’re only going to do it on mobile. This means that we’re going to take our video ad unit or page post ad (or whatever ad type we’re using) and target it only to mobile devices. This is going to allow us to reach more people on a smaller budget since we’re going to pay less per click than if we were also running the ad on desktop. When users visit our content (or watch our video) they will be cookied by Facebook. (Note: If you’re sending traffic to your own website you must have the Facebook Custom Audience Pixel installed for this to work). Next, we’re going to create a “Custom Audience” out of the people that visited our blog post (or watched our video). Tip From the Pros: Your blog post or video content should be relevant to the subject matter of what you’re trying to sell. If you’re trying to sell business software your content shouldn’t be about urban gardening. Lastly, we’re going to create an offer and target it to our Custom Audience that interacted with our content. We know that our offer is going to strike a chord with our Custom Audience because they wouldn’t have visited (or watched) our piece of content if they weren’t interested in the subject matter of our offer. Let’s say that you sell BBQ sauce. Who might be interested in buying BBQ sauce? People that grill, right? How can we reach people that grill? — Show content that teaches tips on grilling! So, make a short video or write a blog post that provides tips for grilling, create an ad and show it on mobile devices, and people click on it and visit our grilling tips. The next time they’re on their laptop (or desktop) and scrolling through their Facebook Newsfeed they’re going to see the ad with our BBQ sauce offer. Since they enjoy grilling and we’ve already established goodwill by sharing valuable content with them, they’re likely to consider buying our BBQ sauce! We’ve just taken this person from one context (flipping through content on their phone) to a second context (in more of a “purchase mode” on their computer). Let’s talk about them in the comments! Shawn McCarthy founded Mix Bowl Media on the premise that businesses needed help with emerging digital ad platforms and strategies. When he isn't making companies money online you'll likely find him SUP surfing, playing volleyball at the beach or hanging out with his daughter.